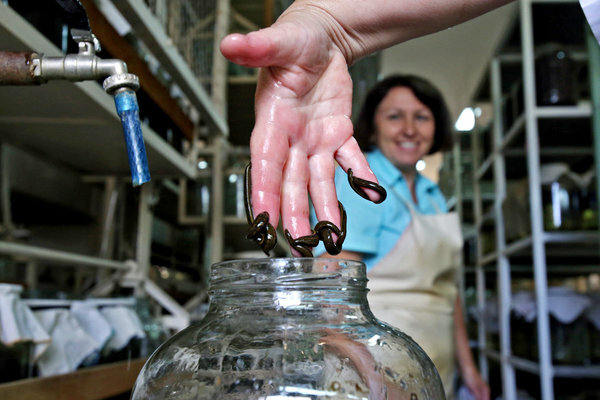 At the International Medical Leech Center near Moscow, leech tenders lovingly raise the slimy creatures. 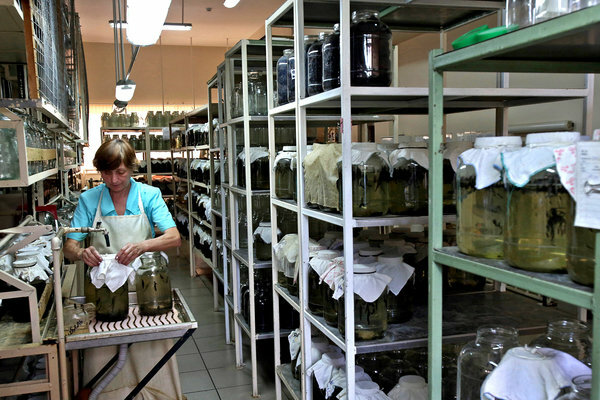 Yelena Titova, head of quality control, inspects a jar at the International Medical Leech Center, one of the oldest and largest leech-farming operations in the world. Yelena Titova shakes a jar holding a few dozen leeches writhing in slightly murky water. When one of them sinks to the bottom, motionless, she plunges her hand in and retrieves the late bloodsucker. She doesn't mind when the survivors try to latch on to her — in fact, she quite likes it. 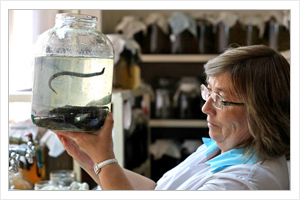 Titova's title is quality-control chief at the International Medical Leech Center, where she has worked for 28 years. But really, she says, she's a nurturer. "All our leech growers are women, because you can tend to leeches with love and care only if you have a motherly instinct," she says. "Men are no good for this job." Titova's breeding facility in this quiet, drab town produces as many as 3 million leeches a year for sale to medical clinics in Russia and nearby countries. Located in an industrial area about 20 miles southeast of Moscow, it's one of the oldest and largest leech-farming operations in the world. The creatures may spark revulsion in much of the West, but in Russia, the ancient practice of leech therapy remains a common form of medical care, with tens of thousands of patients undergoing treatment with hirudo medicinalis and their anticoagulant saliva for anything from infertility to high blood pressure. Because of the higher costs for more modern forms of medication, and a healthy fear of swallowing the bogus pills that have proliferated here, many Russians and their doctors continue to swear by the dark brown worms. Titova, 52, explains that other companies in Russia and Europe collect wild leeches and grow them in open-air reservoirs. That's not her style. "Our production is all indoors and all year round," she says during a tour of the farm. "We have everything here: a mating section, a breeding section, a cocoon section where mother leeches produce offspring." On feeding day, the leeches get blood supplied by slaughterhouses in the area. She mentions that the facility once provided leeches for the dictator Josef Stalin, who used them to treat headaches and depression. "You can only imagine the fear and horror the doctors administering leeches to this madman felt, as any painful sensation, any inconvenience, could cost them their lives," she says. "Luckily, Stalin felt good after each such treatment, and our farm got a future." The short and sturdily built Titova sniffs at modern breeding techniques that involve big aquariums and computerized sensors, saying they can't detect sick or dying leeches. As she passes through a section of the plant, she smells the air, then shakes her head. She calls out to a nearby leech tender, revealing her tendency to treat leeches as human: "Funny smell. Did someone die here?" Yuri Kuranov, 55, a successful Moscow businessman, has used leeches periodically for the last seven years to treat a urinary condition. He reclines comfortably on a couch in a private medical clinic in southwest Moscow. His eyes closed, a contented smile on his lips, he appears oblivious to the slimy creatures crawling below his exposed belly button. "It is like a mosquito bite," Kuranov says as eight leeches do their work. "I understand it is mostly a psychological phenomenon, but almost immediately I start feeling as if a new life force is flowing up and down my veins and arteries." Irina Pankova administers leeches to Yuri Kuranov at a private clinic in southwest Moscow. In the United States, the use of leeches is rare, although they are an FDA-approved medical device (as are maggots). They're considered invaluable among some plastic andorthopedic surgeons, and are occasionally used to maintain circulation after the reattachment of fingers, hands and scalps. "When there's a crisis and you can't structurally repair blood vessels, we call our friends the leeches," said Dr. L. Scott Levin, chairman of orthopedic surgery at the Perelman School of Medicine at the University of Pennsylvania. The farm at Udelnaya typically sell the leeches for $1.50 apiece, and anywhere from one to 10 may be prescribed to feast on a patient, depending on the condition. Most of the leeches sold for medical use are 1 to 2 inches long. The breeder leeches are (somewhat alarmingly) larger. The leeches that Kuranov's doctor says are helping increase his urine flow come from the rows of hundreds of 3-to-5-liter jars at Titova's farm. After being hatched in specially built boxes filled with peat to mimic the wet turf the mother leeches burrow into in nature, the babies are placed in the jars, about 1,000 to a container. The jars fill five production shops on the farm. I have this feeling as if these were my children." The leeches are separated by size as they grow. After a year, they'll be ready for sale. Titova and about 30 tenders examine each of the jars several times a day. The glass nurseries, many of which once held pickled vegetables or tomato sauce, contain filtered water that's changed at least twice a week, she says. "I have this feeling as if these were my children as I feed them, caress them and give them my love," Guseva says tenderly as she puts one jar down and raises another to the light, stirring it to watch its inhabitants move. "I can't tell if they know that I love them, but every time I hold them in my hands I feel this sensation of goodness." The main component of the work at the farm is feeding. The leeches dine once every three to four weeks, sucking up five times their weight. Their food is cattle blood, supplied by slaughterhouses near Moscow. The plant uses about 300 gallons a week, the blood of more than 100 slaughtered cows. The blood is always fresh, sometimes still warm, supplied to the farm on the day of slaughter, Titova says. Many Russians and their doctors continue to swear by the dark brown worms. The farm has supplied the Kremlin with choice specimens regularly since the Stalin days, though Titova doesn't know if President Vladimir Putin uses them. The post-communist years after the 1991 breakup of the Soviet Union proved difficult for the farm, since many drugstores stopped ordering leeches because they weren't as profitable as pills. Many private clinics continue to practice leech therapy, but large, mainstream medical clinics rarely use the creatures anymore. "When I first started, we used to have a bottle full of leeches on a round-the-clock duty desk, but not anymore," says Yelena Syrkina, a docent at the cardiological clinic at I.M. Sechenov First Moscow State Medical University. These days, "we usually prescribe anticoagulant drugs instead. Although from time to time when I see a patient, I still think, 'He could do with a leech.'" Moscow pediatrician Irinia Pankova, however, believes that leeches remain an important treatment in the fields of urology and gynecology, as well as in blood pressure and stroke cases. She says that many young doctors are reluctant to prescribe hirudo therapy but that it is still very popular with Russians who trust all-natural cures. At the farm, the tour passes through a yard that hosts the only known monument to a leech: a depiction of a super-sized one slithering up a pole. The tour ends in the cosmetics shop, where a 70-year-old guard with a holster dozes in a corner. A young female customer checks out various skin creams made with leech tissue, whose healing powers purportedly include improving skin tone and removing dark circles from under the eyes. "Any manufactured drug has a long list of sometimes quite severe and even fatal side effects," Titova says. "But the leech has none. You just need to know how to apply it right." Monte Morin in Los Angeles contributed to this report.